There’s been this video going viral in many different circles on women and beauty. It’s so interesting to me to see the very different sources – people on multiple sides of religious, political, economic spectrums and yet they all agree that women have issues. Funny. It’s easy enough to blame outside forces for everything. It’s the media. It’s hollywood. It’s the terrorists. It’s the evil stepmother. It’s the koreans. We’re so quick to point fingers for all of society’s ills at everything. When it comes to feminine beauty, it’s all about visual aids. I mean that’s obvious right? We are visual people. We want things to look nice. But what does that even mean? You might find that many people start saying things that don’t really have to do with appearances. Sure you might start off with physical traits, but it wouldn’t surprise me to hear words like graceful or kind or cheerful or positive soon enough in there. To me, I want our girls to see beauty as an action, not an appearance. I want women to look in the mirror and not “simply” get to a place where they are happy with their looks – and I say simply though it is far from simple to accept yourself as is – but rather to see the things that matter. Am I kind to everyone I meet? Do I see needs of those around me and help them meet those needs? Am I quick to love and accept others instead of judge and belittle? Do I find fault with everything instead of finding solutions and am I quick to be part of those solutions? Am I lazy or do I work hard, without complaining, to bring about the best life I can have for myself and for those I love? Am I strong in the midst of turmoil and conflict? Do I stick to my beliefs while still being respectful and compassionate? Do I listen to others carefully and encourage and support others or am I too busy whining or lobbying for my own self-gratification and fighting to always get my way to meet my goals and ambitions? Do I think of how to benefit others and promote their well being? Am I considerate of all viewpoints or am I yelling too loud to even hear them? Do I have a clear conscience? Can I look in the mirror at the end of the day and know that I have been truthful and good and honorable and full of grace? Sure, we are too obsessed as a culture with appearance. We spend a lot of time in front of the mirror looking at the bridge of our nose, or how to better apply our eyelashes and how to remove the hair on top of our lips. Every other day, I stand in front of my closet with my hands on my hips and loathe every single outfit I have and think about how frumpy I look (pregnancy notwithstanding – this happened long before I got knocked up). I’ve always hated the phrase “beauty is only skin deep.” Beauty has nothing to do with the skin and the skin can cover the ugliest of souls. To me, there is nothing uglier than self-centeredness, nothing more repulsive than a frequent whiner, few things more distasteful than gossip and slander, and even fewer things more lovely than a kind soul. 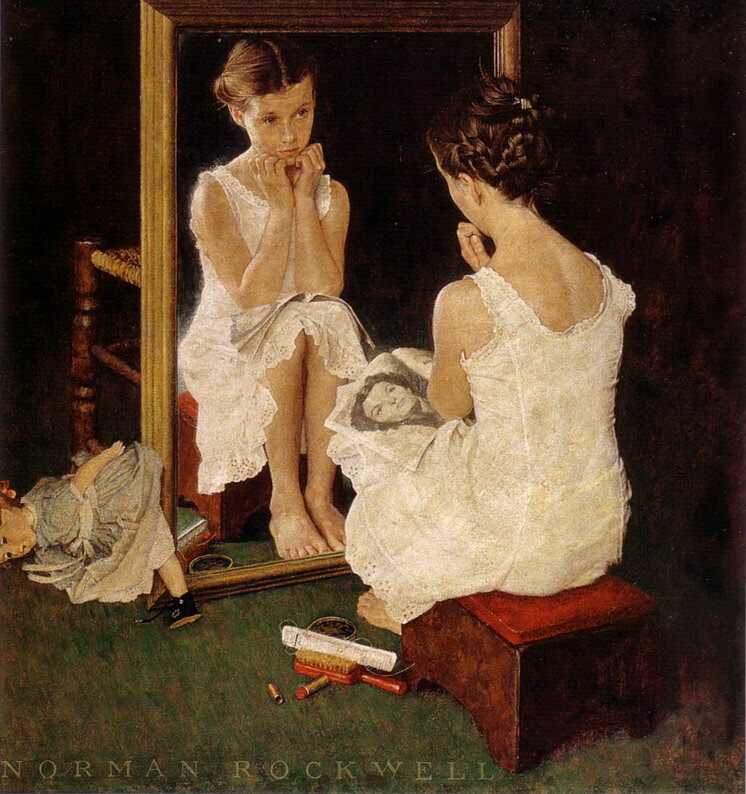 Yes, we should be encouraging women and girls to think of themselves as beautiful, but for the right reasons and measured by the right indicators of real beauty, and remind each other that without these things, you can call yourself beautiful all the live long day, but you never will be. Appearances change. Fads and trends come and go. What is seen as “ideal” will morph with history. But true beauty will always “look” the same and it will be seen with the heart, not just the eyes. That Dove commercial diatribe makes me a little nuts. It’s not politically correct enough, it doesn’t feature enough minorities, its message of affirmation isn’t good enough because it’s not applicable to everyone… gimme a break. It’s a soap commercial. no I agree. it is all hyped up. says something even more profound about beauty I think. that we are so desperate for affirmation of our physical selves. You said it so well. With this Dove video: Why do we have to go all over the point of how society expects us to be beautiful and reaffirm this. How about defining women differently instead, like by the things you list in your last paragraph. Like you, I am all for making the most of whatever will help in the world, beauty included. But the ad! It’s just telling us that everything is about beauty AGAIN. Good grief–it’s SOAP!